Yes, that’s right. Chocolate gravy. Quinn had never heard of chocolate gravy when we met, but I quickly introduced him and he’s been much happier ever since. Basically, imagine chocolate with the consistency of gravy. I am quick to tell you that I don’t like gravy at all. Not even a little. But, chocolate gravy… well, that’s another story. It’s so wonderfully thick and chocolate-y. Actually, it’s more than wonderful, and I’m not sure any words I can use here would do it justice. Let’s get the biscuits out of the way first. 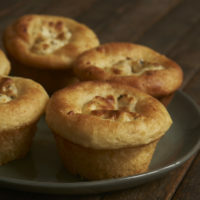 They’re much like traditional biscuits, but they’re made softer and bolder with a bit of cream cheese added to the dough. They mix up quickly and don’t require any rolling. Just pat the dough out on a lightly floured surface and cut them out. And their flavor goes so well with chocolate gravy! While the biscuits are cooking, there’s just enough time to whip up some chocolate gravy. I admit that I don’t know the exact origin of this recipe. I’ve tried many recipes over the years, and this one works best for me. If you’ve ever made chocolate pudding, you’ll notice some similarities in the method for making chocolate gravy. The ingredients are a little different, but it’s still cooked on the stovetop with a good bit of whisking. It’s so, so simple to make that you’re likely to find yourself making it often. This is one of our favorite lazy day breakfasts. For those of you unfamiliar with chocolate gravy, I suggest that you become familiar with it as soon as possible. It is definitely one of my very favorite things. 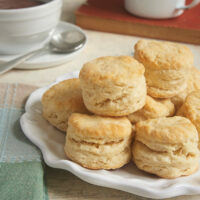 It’s good on any kind of biscuits, but the cream cheese biscuits are especially good. Whether or not you’ve ever had chocolate gravy, I hope you’ll be inspired to whip up some for a breakfast treat! 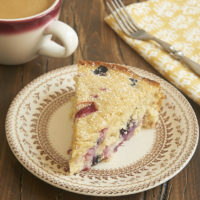 Visit the Recipe Index for more breakfast recipes! 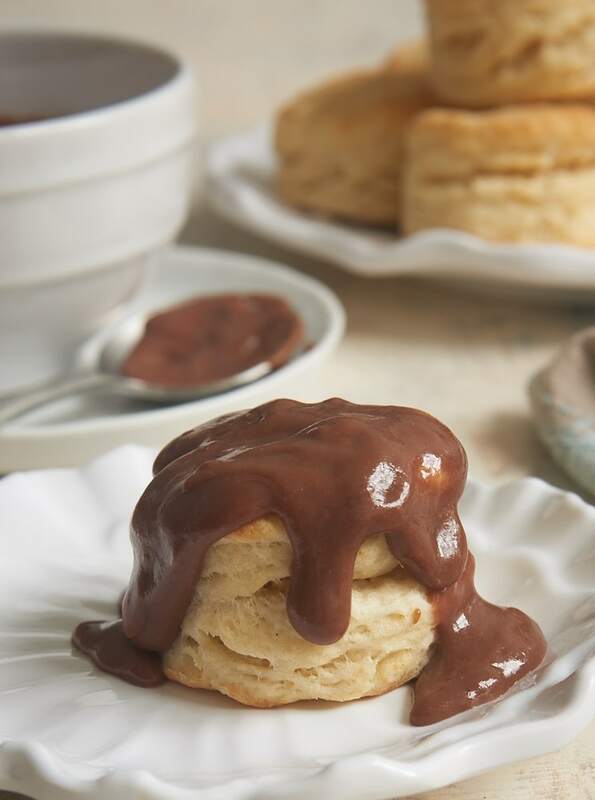 Cream Cheese Biscuits and Chocolate Gravy are long-time favorite for a sweet breakfast or brunch treat! Use a 2-inch round biscuit cutter to cut out the biscuits. After you’ve cut out as many biscuits as you can, gather the dough once more and cut out the remaining biscuits. In a medium saucepan over medium heat, whisk together the sugar, flour, cocoa, milk, and water. Bring to a boil, stirring constantly. Continue cooking and stirring until thickened (about 3 or 4 minutes). Remove from heat and stir in the butter and vanilla. 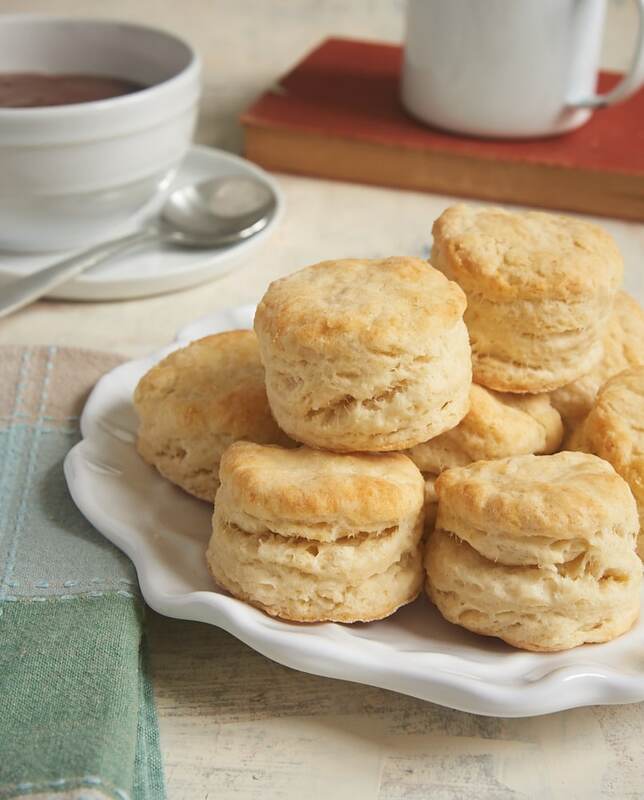 Serve warm over biscuits. i used to bake a lot, but for some reason i haven’t recently [i think its because usually i bake when i’m stressed and since school hasn’t picked up yet, im not stressed] but your recipes are constantly inspiring me. i’m getting that ansty feeling… i think i’ll bake soon! Hope you enjoy it, Alicat! Connie, thanks for that very nice compliment! Also, when you’re cutting your buiscits, don’t twist. Just press down and pull up. Twisting causes them to “close” on the edges. Claire, one trick is not to roll out the dough too thin. The thicker the dough is, the thicker your biscuits will be. Also, shortening makes biscuits very flaky, much like store-bought biscuits. Lard even more so, but most of us don’t use it because, well, it’s lard. I think anyone would be happier after having learned of chocolate gravy! My Granny Gray told me, “use a wooden spoon and heavy pan” when making he cholcolate gravy. My memory fails me, do you do that when making yours? The last time I made the gravy, it was a bit too runny. Your picture looked like it had a very nice consistency. My dear Nuwanda, I did use a heavy pan (Le Creuset) but a whisk instead of a wooden spoon. I had your (or Granny Gray’s) recipe at some point, but this one is a bit different if I’m not mistaken. I was amazed when I typed “chocolate gravey” into the search box to come up with a recipe. In Arkansas in the 1940s my mother made us chocolate gravy and hot biscuits as a treat for breakfast. The cream cheese biscuits sounds like a nice fit. I love choclate gravy and biscuits. The creamy gravy with big hunky biscuits!! Wow… just found your blog and am loving it. Chocolate gravy is a huge tradition in my house. My daddy used to get up every Sunday morning and make it for us. When I brought my husband home to eat one Sunday, his Danish eyebrows hit the ceiling… he wouldn’t touch the stuff initially. However, he’s now the primary cook in our family and my Daddy shared the recipe. Anyhow (sorry for so many words!) I’ve always thought of it as a Southern tradition–as it’s mainly other Southerners who seem to know about it. I’ve yet to meet a Northerner that doesn’t think I’m crazy for mentioning it! I’m glad you found me, Wende! I agree with you that chocolate gravy is a Southern thing. In any case, it’s certainly a delicious thing! Theresa, I hope this recipe reminds you of your mother’s chocolate gravy. It really is just one of the best things. Wow wow wow. My husband and I both grew up in Alabama eating chocolate gravy and biscuit. We just assumed EVERYBODY did. We raised our kids on it. It was a weekend treat. I did not know it came from Arkansas, but my maternal grandmother had roots there. When we moved out west, boy did we gross out some people. No one out here gets it! So I would say its a southEASTERN delicacy. Bacon or sausage is the perfect accompaniment. BTW: My Grammaw would take the leftover (yes there was leftover, because she made a LOT) and pour it over the broken up leftover biscuit. Stir it real good and put it in the fridge. We call it “Cold Biscuit Pudding”. Thanks for the memories! I was raised on chocolate Gravy and Biscuits! It’s been a mainstay and a tradition in our family for as long as I can remember. I’ve never used vanilla or butter at the end in my gravy… or the (Yummie) Cream Cheese Biscuits (just well buttered ones) But I will be trying this -It can only Get Better!! I have wondered many times if my family was alone in their love of chocolate gravy & biscuits. 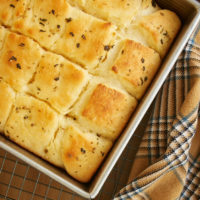 My recipe was passed down from my mom, from her mom, and her mom, who got it from a lady she knew who lived in Arkansas. My family actually comes from around the “bootheel” area in Missouri. I had even heard that at one time a small resteraunt in Poplar Bluff , MO had it on their menu. Haven’t had the opportunity to confirm that yet. Now I serve this to my kids. It not only tastes good, but it makes me feel kind of special knowing that the recipe comes from our family ties and is very localized. Sharesa, chocolate gravy is one my all-time favorite things. In fact, your comment today has reminded me that it’s been far too long since I made it. Perhaps I can remedy that this weekend. Am from Arkansas and this one of our family fav. Here is my recipe for Chocolate Gravy. I mix up a few batches at a time. Then just add milk to make. It keeps well in an jar for a long time. Most people don’t add enough cocoa to make it rich and chocolatey. Gradually stir in milk. Cook over low heat until thick. Stir constantly, as it will and scorch easily. Serve over hot biscuits with butter. Ann, your recipe does indeed sound rich and chocolatey. I like the idea of keeping the dry ingredients mixed up and ready to go. Thanks for sharing! When I was in Jr. High and lived in Tennessee with my parents, I had a friend whose mom used to make bisquits and chocolate gravy on the weekends. It was incredible and when I tell people about it . . . they think I’m nuts. I’m am so excited to find this recipe and am going to try it tomorrow morning! My kids have never tried it; but, have heard me talk about it. Now they’ll get to finally know what I’ve been talking about!! Thanks! Janice, I hope you and your kids enjoy the chocolate gravy! Jennifer, My kids loved the biscuits and the chocolate gravy! The gravy was a little darker and less Milk Chocolatey (is that a word) than what I remembered. So, I made it again tonight and used 1 cup of milk instead of 1/2 c milk and 1/2 c water. I also added 1/2 c sugar instead of 1/3 c sugar. The color, thickness and taste ended up being “exactly” what I remembered! Thanks and have a great weekend everyone! So glad you liked it! I don’t think I’ve ever known two people who made it the same way. Anyway you make it, it’s certainly delicious! I had to pull out my Chocolate Gravy Recipe to compare to yours! At first I was like, what? But then I realized mine basically is yours (tripled) sans butter, and mine calls for all milk & no water + a dash of salt. My recipe is from a good ol’ Arkansas lady who must’ve needed to make a lot! I’m so glad to here you say, you’re also not a gravy person! Christy, it’s always nice to meet another chocolate gravy fan. It’s the best, isn’t it? Jen, I hope you and your husband enjoy the biscuits and gravy! my mother in law used to make the gravy for my husband often, i wanted to give it a go, but didnt want to make just any regular biscuits, awesome recipes, we both really enjoyed it. OMG THANK YOU THANK YOU THANK YOU! When I was little I used to have bisquits and chocolate gravy every sunday. My great gramma would make em for us. I have meaning to get the recipe from her… But I think I might try this one as well. 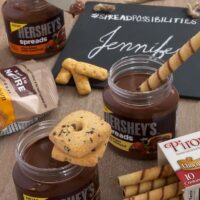 I know what yall are saying my northern friends here on the border of ill. and wis. have NO clue what I’m talking about when I say bisquits and chocolate gravy they all think I’m insane! I might just have to whip some up and deliver them to all of my northern friends! Thanks for the recipe! Oh my, I didn’t know anyone else ate this! My mom (who is not a cook) used to make chocolate gravy for us when we were little. I now make it for my children. My best friend is from NZ and thought it would be yucky until I made it for her children. Now, they love it too. If you have never tried this, I suggest you do. It is wonderful! Think of it as warm, chocolate , gooey pudding! My son loves the chocolate gravy recipe. Thanks for posting it. I love this. Chocolate gravy was the one thing mom allowed dad to make while she made buttermilk biscuits. The pictures also look like the consistency and the recipe is pretty much identical to dad’s. So glad to have found this, brings back many memories.